After Roger's loss in London the topic of conversation in his post match press conference somehow got onto the speed of the courts and once again he spoke about the need for speeding up the game. Damn right. It's an easy fix. Just make quicker courts, then it's hard to defend attacking style is more important. It's only on this type of slow courts that you can defend the way we are all doing right now. Which is hardly surprising seen as though the Fish vs. Federer match in Cincinnati this year was pure exicitement from the word go and that court isn't even as fast as it could be! For too long now the ATP have been slowing down courts across the world to the point where there's little variety, Miami, a hard court plays almost identically to a clay court. The grass at Wimbledon gets slower and so do the outdoor hard courts across the world year on year. That shouldn't happen. In recent years we've seen the Australian Open move from the quick Rebound Ace surface to the slower Plexi Cushion. Tsonga blew Nadal off the court the last time Rebound Ace was in use, we're unlikely to see that again. The US Open courts are getting slow year on year due to it being laid later in the year and more sand being used in the top coat. We're also noticing that Arthur Ashe is noticeably slower than than any of the other outside courts. Coincidence? Probably not. Indoor carpet courts are now eradicated at ATP level and they were some of the quickest courts around ensuring tennis is played at it's purist. It's a sad state of affairs. Like everything in the modern world it all stems down to money and the guys who run the game want to line their pockets as much as possible without really caring about the fans and especially not the players. Slower courts invariably mean longer matches and that always translates to more money, fans are in the stadium longer buying more over priced food and drink and the TV broadcasts get longer meaning more air time and more ad revenue. Again, that's all about money, those guys sell the tickets, they're who the TV broadcasters want to be contesting the finals. But should the courts be slowed down so that the top 4 guys always make the semi finals just because they can defend better and outlast their opponent? I'm not so sure. As a Federer fan of course I want to see him make the latter stages of a slam, but if he loses to a rank outsider on a fast hard court I'm not going to be blaming the speed of the courts. The ATP and ITF should think of the players first, they're the guys who make the game what it is, not hot dog sales. No players should be protected by the speed of the courts, the seeded draw system is more than enough help. Sadly, greed and internal politics gets in the way of the true meaning of the sport. It's not about how the game should be played, just how much money can be made off the back of it. As we saw in Madrid there are certainly some players on the tour that only have their own interests at heart. Faster, varying courts present a threat to them and they know it; meaning they're quick to oppose any sort of change. You only have to look at how the Blue Clay fiasco panned out with Nadal and Djokovic to realise they don't want variety in the game. It throws them out of sync and makes them more vulnerable to a loss. Faster courts give outside players a much higher chance of winning. If they're able to catch fire in a match they might just be able to pull off the upset of a lifetime. I for one believe that faster courts also make tennis more about skill and less about endurance. Skill is why I watch the sport, I'm not interested in which player can keep on running, those things can be trained or doped. 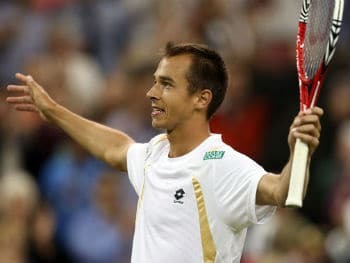 A prime example of this is the Rosol vs. Nadal match at Wimbledon this year, that match is undoubtedly one of the most entertaining of the year. All because on a reasonably quick grass court the gap between the top 4 and the top 100 gets closer. Rosol teed off and the better man on the day won. Endurance was't a factor, shot making and aggression were. By saying this, Roger has shown that he knows and believes that nobody is bigger than the sport itself. He wants better distribution of prize money and he also wants the courts to be quicker to make the game more interesting. Both for the players and the fans. Huge upsets, under dogs taking top seeds to the wire and aggressive shot making = excitement. Defensive, 45 shot rallies and 5 hour matches, do not. I think some variety would be nice, some really slow stuff and then some really fast stuff, instead of trying to make everything sort of the same. What you don't want is that you hit 15 great shots and at the end, it ends up in an error,” he said. “So I think sometimes quicker courts do help the cause. I think it would help from time to time to move to something a bit faster. That would help to learn, as well, for many different players, different playing styles, to realize that coming to the net is a good thing, it's not a bad thing. Like Roger says in his quote above, variety is needed across the year. I'm not suggesting that every court has to be lightening fast, the tour should be a mix – some hard courts should be fast, some should be slower. Some clay courts should be slow and others a little quicker. Grass of course should only ever be quick. That way we get to see a true test of a players ability, their adaptability and how they can handle different conditions and court speeds. It'll prove, are they just a product of endurance and racket technology; or are they the real deal? Do they deserve to be mentioned in the same sentences as the Rod Laver's of the tennis world? Variety is the only way we'll find out. It should never be the case that a player can play the exact same style on all 4 surfaces and still be successful and sadly that's the way tennis is going. Why do I want faster courts? In my eyes, the ATP have attempted to homogenise all 4 surfaces to the point where they're all practically identical. Attacking tennis no longer reaps the rewards it deserves and the sport has become one of endurance rather than skill, and as a fan of tennis, not just Federer, I want to see that change. What do you think? Should the ATP make the courts faster on the whole presenting variety across the year? I agree, it’s getting all too predictable for me. As a Fed fan I want him to do well, but on merit, not by outside assistance. Also, I’m from a country where nationalism is very accentuated (ex Yugoslavia), this is the reason why Serbs are cheering only for Djokovic (so stupid)? !I appreciate it, but not his game! I’ve never trained tennis or love that sport, but once I accidentally looked match where there is played Roger, I would say that it is an art of tennis! A delight for the viewers, I want to continue to enjoy! This year, the only court which i felt was as fast as it should be was dubai. Thank god roger has decided not to play miami, they should just make it a clay court and make it with the other clay masters, it would make it much better, and it might even play quicker than now! I was surprised to find that he wont be playing basel next year, but who cares! We need him to be playing the big ones to be able to get adequate rest inbetween tourneys as he gets older. Good luck next year rog! Yeah, surprising no Basel. Schedule is of course subject to change so I guess it depends whether he can sort out his differences with Roger Brennwald. Apparently he wanted to buy the tournament outright but Brennwald wouldn’t let him. Hey Jonathan, what a great post! Love the speedometer pic and that Fed vs Nalbandian match, wow! 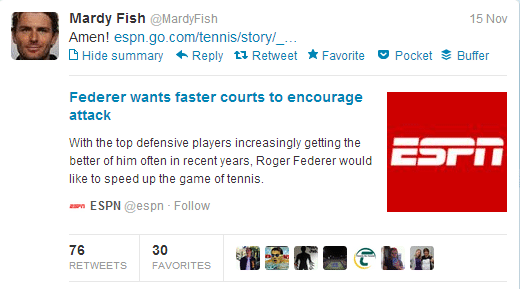 You know, I’ve heard Roger talk about court speed before – not just after a loss. One point he’s making and I think, most of us are too, is exactly as you say, variety (he didn’t say all courts should be fast). I grew up in America with primarily outdoor hard courts (playing in school and for recreation – no country clubs even in the picture for my modest upbringing) and clearly remember the moment I discovered tennis being played on other surfaces. It was hardly conceivable. But it was exciting to learn about court speed and varying conditions and brought so much more interest to the game and a much broader world of sport to me. Anyway, I’m so glad to know I’m not the only one turned off those long drawn out marathon matches with “gazillion hit” rallies! Skill and variety are what first attracted me to Roger’s game as well as others with similar playing styles. Thanks for your insight and a beautifully articulated case for faster courts! I know he’s mentioned it many times, even after his win at the Paris Masters last year. So for people to say he only brings it up after a loss isn’t true. Hope the ATP change it, but I doubt they will do. Money means more to them than tennis. Absolutely awesome piece, Jonathan. Something really needs to be done. Variety is a great thing and honestly, if we can get to a point where anyone in the top 50 could have a chance to beat the top guys on any given day, that will make the game much more competitive and exiting. Yeah it’d make tennis way more exciting. Grind fests all year round get boring. Think of the days of Bjorn Borg. He was a clay specialist and got destroyed on grass. So he decided to adapt his game to a different surface by amping up his serve and working on his net game. He went onto with not only 6 French Open titles but 5 Wimbledon titles in a row. Year-after-year he changed his game style to follow a French with a Wimbledon. That is what players should be able to do now. Tennis needs a return to the days when a change of surface meant more than just a change of footwear. So true. And it’s not like Rafa and guys like him can’t adapt. Rafa can amp up his serve and flatten out his strokes and try to shorten the points. In fact, with Rafa’s knees, you think he would want faster hardcourts so he doesn’t have to play as many long rallies. It’s a slippery slope, Kyle. If Nadal flattens his ground strokes, then he pretty much walks into comfort zone of Roger and many other players too who would rather deal not deal with those high trajectory top spinning deliveries. Hitting flat against Roger is only a bad thing if he’s on his game. Delpo, Berdych, Tsonga, Soderling, Nalbandian, Davydenko, and Agassi are all examples of guys who can beat Fed by hitting flat and early. Nadal is never going to be pro speeding up the courts though. Forget what court speed means H2H though, it’d just make tennis more fun whether Roger wins or loses. Jonathan, not exactly sure what the H2H would be but I’m sure it is a healthy 3:1 ratio. Another excellent post. Couldn’t agree more! I’d rather watch old matches on youtube such as the above than recent matches of Nadal/Djokovic/Murray/Berdych etc on TV, in fact I didn’t even watch any of this year’s grand slum finals except Wimbledon of course. Attacking/exciting/unpredictable tennis will die with Roger one day and many of true tennis fans will go, too. I just can’t understand why the ATP cannot see this? Boris Becker said Federer would be the only one who could have competed successfully in the era his with serve and volley, I think so, too. I really appreciate that you are keeping us interested in tennis as I miss Federer and the sport after the season finished…thanks for the great job! Yeah I saw that Becker article, I think he’s right. Somehow you get the feeling Roger is the only one who’d stand a chance with a wooden racket. Like it wouldn’t be completely un natural to him. I can’t say the same for Nadal, Berdych and Djokovic. Murray seems to have pretty good racket skills so maybe he could play with wooden. No way he’s hitting his ground strokes like he can with his head racket though. Roger’s racquets are the closest you could get to a wooden racquet these days. 90 sq in (85 sq in until mid 2000), 365 grams, 9 point headlight etc. He would feel completely at home with a wooden racquet. Yeah think he has the smallest head size on tour. Not sure who else uses a 90 these days. Rare. Great post. All courts are slow now. In almost all matches there is a winner without hitting winners. Sampras would not have won many matches these days. Djokovic, Murray, Nadal, Ferrer would have broken down his backhand on these courts. Yeah I agree man, Sampras backhand would never have held up. The ATP should sort it out but they won’t. Your best as yet. Like Tom Cruise in Top Gun, Fed needs the speed and rightly so. I have watched Fed and all the others live ( barring Rafa ) at Dubai which is the fastest and the games were exciting to watch. There was a great match between Fed & Delpo and I was sitting amongst loud Argentines all wearing football shirts. A great match also between Gasquet & Simon last year. Gasquet won of course going to prove that fast courts directly proportional to skill. God help tennis after Fed. Bet watching in Dubai was fun. I enjoyed watching the Del Po match on TV, coming back in the tie break was awesome! I agree man, the faster the court the more shot making and aggressive tennis at the fore. I just want to see a mix. Clay is still good for tennis, I think it’s the surface that can find out flaws in a players technique which is probably why Sampras never won it because his backhand wasn’t great. But clay should play like clay. And hard courts should play like hard courts. Not all the same. The Australian open switched to plexicushion In 2008 which was the year Tsonga beat Nadal. Yup and the year Djoker first won it. He’s 6-0 in sets vs. Roger on plexicushion.